PRIDE – Obedience or Defiance? In our last post, we saw how the worldly defined pride . . . prideful explanations of why pride is a good thing. We also saw how the text defined pride . . . how pride is NOT a good thing – how it is just the opposite of what the world promotes and adores: an exaltation of SELF. We learned that pride is presumptuous – that to be prideful is to behave insolently. Pride ignores the poor and needy. Pride testifies against you to the Creator of all things. It mistreats the righteous. It leads to disgrace. It is used by those that would usurp the role of God by speaking for him. It opposes God. Finally, we remembered how the serpent used pride to get Eve to pick its lie over God’s truth by telling her she would be like God if she ate the fruit. Pride is a lie – Pride is an illusion – Pride is a sin. Man, proud man, drest in a little brief authority, most ignorant of what he’s most assur d, glassy essence, like an angry ape, plays such fantastic tricks before high heaven, as make the angels weep. Pride is pleasure arising from a man’s thinking too highly of himself. So much of how we act and what we do is based on humility or pride – that’s everything. And when you can humble yourself, you know, we are more like Christ when we can humble ourselves. These are just a few quotes by famous people in history that don’t see pride as something to aspire to, but as something to be wary of. The disparity between the two side is large. before being honored, a person must be humble. but the humble will be honored. and whoever humbles himself will be promoted. this man went down to his home right with God rather than the other. Adonai alone will be exalted. he blesses greed and despises Adonai. The adjective rāshāʿ, “guilty,” “evildoer,” “impious person,” like the other words from its root, often refers to being guilty of a wrong—especially against another person (Exo. 2:13; Num. 35:31). It is often translated “wicked” and used as the opposite of being righteous, such as in the classic contrast of Ps. 1:1, 4ff. Some characteristics of the wicked are that they do not seek God (10:4); they forsake the Law or instruction of God (119:53); they are cruel (Prov. 12:10); they gush evil from within them (15:28); they crave evil with their whole person (21:10); they are rejected by the Lord and will be cut off and perish (2:22; 21:27); and they have no peace (Isa. 48:22). Thoralf Gilbrant, ed., “7857,” in The Complete Biblical Library Hebrew-English Dictionary – Pe-Resh, (Springfield, IL: World Library Press, Inc., 1998), WORDsearch CROSS e-book, Under: “7857”. Thoralf Gilbrant, ed., “2054,” in The Complete Biblical Library Hebrew-English Dictionary – Gimel-Zayin, (Springfield, IL: World Library Press, Inc., 1998), WORDsearch CROSS e-book, Under: “2054”. …Taʾăwāh also means “lust” in the bad sense. In the desert wilderness, the children of Israel on their way to Canaan complained about their journeys. They remembered the food of Egypt and rejected the provision the Lord had given them: “The mixed multitude that was among them fell a-lusting: and the children of Israel also wept again, and said, Who will give us flesh to eat?” (Num. 11:4). They lusted a lust (cf. Ps. 78:29f). The result of this attitude was disciplinary punishment: “While the flesh was yet between their teeth, before it was chewed, the wrath of the Lord was kindled against the people, and the Lord smote the people with a very great plague. And he called the name of that place Kibroth-hattaavah [the graves of lust]: because there they buried the people that lusted” (Num. 11:33f). Thoralf Gilbrant, ed., “8707,” in The Complete Biblical Library Hebrew-English Dictionary – Sin-Taw, (Springfield, IL: World Library Press, Inc., 1998), WORDsearch CROSS e-book, Under: “8707”. …This verb primarily denotes the favorable relationship between object and subject. Rather than focus on ritual or magical utterances, the function of the verb in most of the contexts it appears in is to express the sentiment of gratitude or honor. Only rarely is this verb used as a request (1 Ki. 10:9; Prov. 5:18; Ruth 2:19). Job said of the wicked, “For what is the hope of the godless, though he may gain much, if God takes away his life?” (Job 27:8). In Lam. 2:17, Jeremiah declared, “the Lord has done what He purposed; He has fulfilled His word.” Job expressed his desire to die by saying that he wished God would let loose his hand and cut him off (Job 6:9). Hezekiah, being extremely ill also spoke of God cutting him off (as a weaver would material from the loom) to indicate death (Isa. 38:12). Thoralf Gilbrant, ed., “1239,” in The Complete Biblical Library Hebrew-English Dictionary – Aleph-Beth, (Springfield, IL: World Library Press, Inc., 1998), WORDsearch CROSS e-book, Under: “1239”. The noun connotes a variety of nuances having to do with rejection. Most occurrences refer to the rejection of Yahweh, often in covenantal contexts. The wilderness generation repeatedly rejected Yahweh, ranging from the rebellion of Korah (Num. 16:30) to the lack of trust in Yahweh’s warring ability in light of the report of the spies (Num. 14:11). Yahweh announced his coming rejection by the people once they settled in the land (Deut. 31:20). Jeremiah pleaded not to have the Covenant revoked—for Yahweh not to reject his people (Jer. 14:21). Lamentations records the rejection by Yahweh of his leaders (Lam. 2:6). A number of individuals rejected Yahweh. The wicked and impious of the Psalms did so (e.g., Pss. 10:13; 107:11). David rejected Yahweh by having an adulterous encounter with Bathsheba, although ultimately Yahweh did not reject him (2 Sam. 12:13). The sons of Eli disrespected the offerings given to Yahweh, thus forfeiting their lives and the priestly lineage (1 Sam. 2:17). False prophets likewise rejected Yahweh while ironically proclaiming that they spoke in his name (Jer. 23:17). Pagans also despised the name of Yahweh (cf. Isa. 52:5). In non-Yahwistic references, the noun is used to describe the attitude of those who do not wholeheartedly seek wisdom and despise reproof (Prov. 1:30; 5:12; 15:5). Ultimately, since wisdom comes from the fear and knowledge of Yahweh, lack of interest in wisdom is tantamount to a rejection of Yahweh. The common denominators of these nuances are that the one who despises absolutely rejects the one who is despised, and the despiser is already acquainted with the despised before rejection. The verb has both a legal force, in the case of covenantal revocation, and an emotive force which damages one’s relationship with Yahweh. In all cases, the verb conveys complete, but not necessarily permanent, rejection and separation. Thoralf Gilbrant, ed., “5180,” in The Complete Biblical Library Hebrew-English Dictionary – Nun-Ayin, (Springfield, IL: World Library Press, Inc., 1998), WORDsearch CROSS e-book, Under: “5180”. YHWH Yahweh. The personal name of the living God found 6,823 times in the Old Testament. It is his redemptive, covenant-keeping name, called the Name (Lev. 24:11,16) and “this glorious and awesome name” (Deut. 28:58). Thoralf Gilbrant, ed., “3176,” in The Complete Biblical Library Hebrew-English Dictionary – Heth-Yodh, (Springfield, IL: World Library Press, Inc., 1998), WORDsearch CROSS e-book, Under: “3176”. the great I AM whose is faithful to his covenants – who is the beginning and the end – who will be what he will be – whose name is his reputation. 305 ‏גָּבַהּ‎ (gābah) <H1361>, <H1362> be high, exalted. 305a ‏גָּבַהַּ‎ (gābōah) <H1364> high, exalted. 305b ‏גֹּבַהּ‎ (gōbah) <H1363> height, exaltation. 305c ‏גַּבְהוּת‎ (gabhût) <H1365> haughtiness (Isaiah 2-11, 17, only).
. . . The usual nuance behind the words under discussion is pride or haughtiness. Of interest is the negative usage of this word in connection with some part of the human body. For example, pride is linked with the heart in: Ezekiel 28:2, 5, 17; Psalm 131:1; Proverbs 18:12; 2 Chron. 26:16; Jeremiah 32:25 (all with the verb); Proverbs 16:5; 2 Chron. 32:26 (with adjective and noun). Isaiah 2:11; Isaiah 5:15 and Psalm 101:5 connect pride with the eyes. Proverbs 16:18 and Eccles. 7:8 tie pride with man’s spirit, and Psalm 10:4 with man’s “nose”/countenance. On a few occasions individuals are said to be guilty specifically of this sin of pride: Uzziah (2 Chron. 26:16); Hezekiah (2 Chron. 32:25-26); the prince of Tyre (Ezekiel 28:2, 17). Conversely, Isaiah speaks of the suffering servant who will be exalted (rûm), lifted up (nāśaʾ) and be very high (gābah) (Isaiah 52:13). In the LXX the word is translated as hupsos or hupsēlos, but never as hubris. Bibliography: TDOT, II, pp. 356-60. THAT, I, pp. 394-97. R. Laird Harris, Gleason L. Archer, Bruce K. Waltke, ed., “305: ‏גָּבַהּ‎,” in Theological Wordbook of the Old Testament, (Chicago: Moody Press, 1980), WORDsearch CROSS e-book, 145-146. 3 For the guilty and impious person – one that does not seek God – one that forsakes his laws or instruction, exalts and praises himself on account of his appetites, longings and lusts; he gives honor to gains or unjust profits through or by: dishonesty, greed and/or injustice and has rejected and looked with contempt on the great I AM whose is faithful to his covenants – who is the beginning and the end – who will be what he will be – whose name is his reputation. God is nothingness – He does not exist. You see when we raise ourselves up – when we exalt ourselves, we arrogantly state that “we do not need God.” Our pride becomes our means to our accession to the throne of heaven. We dismiss God and his commands as inconsequential. We are going to heaven regardless. One that is prideful has to come to this conclusion! Why, you might ask? Because if one considers even a modicum of what the text says concerning pride leading to Sheol, one would have to dismiss much of the text to continue in a prideful state – to dismiss that text is to dismiss the one that gave us the text because as you may remember earlier in this post, we learned that the text tells us that Adonai ALONE will be exalted! God is nothingness – He does not exist! This is sin – pure and simple. Intense post, huh? In our next post on pride, we will deal with some real world examples past, present and personal of how much pride is embedded in our lives as believers – much of the time without us even aware of it. Be blessed and have a wonderful time with your families on this 4th of July! This entry was posted in Living life Even if . . 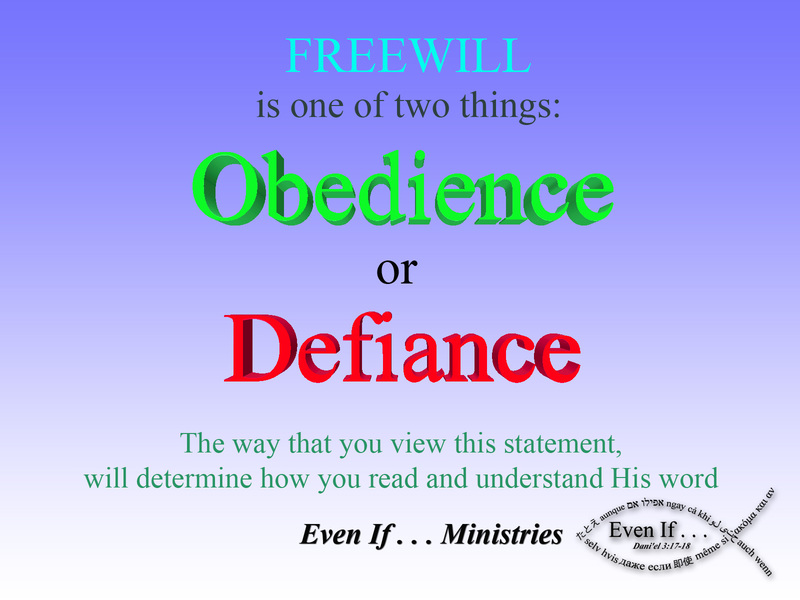 ., Word Studies and tagged freewill, Isaiah 2:11, pride, Psalm 10: 3-4, sin. Bookmark the permalink. 2 Responses to PRIDE – Obedience or Defiance? This is a very serious teaching. You can’t “just read it”………..definitely a “pebble” or a boulder.